A little firecracker of a stud, Peter Piper was a perennial crowd-pleaser. Though 14.1 hands, he had huge spirit and presence. 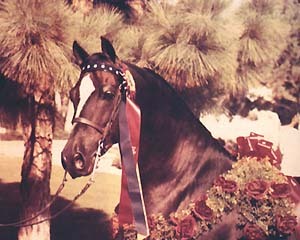 As a mere weanling, he took Reserve National Champion Stallion in Northampton, Mass. 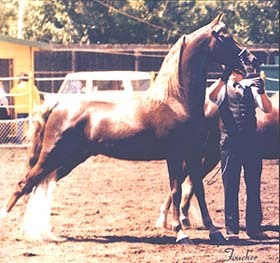 He was also the Reserve Junior Champion Stallion at the Eastern Nationals for 3 years. 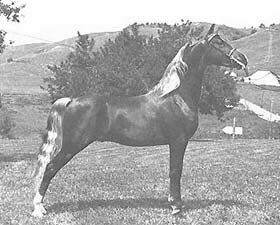 He became the Triple Crown Winner of Region 7 at 6 years old, capturing the championships in in-hand, park saddle and park harness. 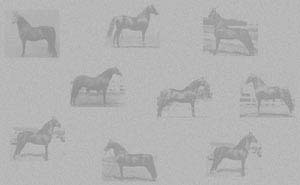 Peter Piper has also left his mark as a sire. 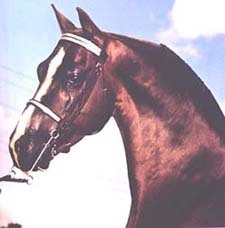 One notable son is Mantic Peter Frost (pictured right and below), the 1982 Reserve Grand National Senior Champion Stallion. 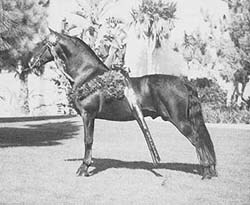 He himself has sired the 3 World Champions Mantic Monique, Majesty Peter Prince and Marin Levi. Saddle and Bridle rated Peter Frost the 3rd leading sire of pleasure horses nationally in 1989.